Our specialty at 1st Response Electronics is In Home Television Repair. Most repairs can be performed in your home and usually on the first visit. Our technicians are trained to repair your TV down to the component level to reduce your repair cost. If a component level repair is not possible we will give you options and a recommendation. RF / Coax Cable Connector Replacement. We want to make your TV repair experience painless. We repair your TV the correct way, the first time! Our technicians have shoe protectors to keep your floors clean. Call us for advice! We can offer you a second opinion. 1st Response Electronics repairs all TV brands including: Hitachi, LG, Panasonic, Pioneer, Samsung, Sharp, Sony, Toshiba, Vizio. Need a Lamp? We carry most LCD and DLP lamps! Quality lamps are necessary to maximize the performance of your TV. We carry only Osram or Philips lamps. Most electronic items have sophisticated protection circuits. To prevent the damaged circuits from causing more problems. Usually the indicator leds will blink in a particular sequence to provide information to the technician. If your TV is providing a protection code please notify the technician when you call. 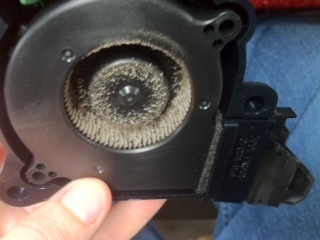 This is an example of a fan used in a Mitsubishi DLP. It was clogged with dust and caused the lamp to fail.